say i do, and flowers too! 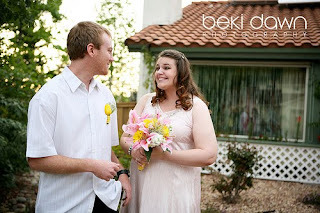 While all of my weddings are special to me, this one had a big place in my heart. The wedding of Michael and Hannah took place this past Saturday in a home I spent many days and nights in during my childhood! My bestie's parent's house! Jenny is one of my very best friends, and I have known her and her family since the 1st grade at Pomerado Elementary School. In fact, if you know me, Jenny, Kelli, and I are "The 3 Best Friends That Anyone Could Have!" Sing it... We 3 have known each other practically our entire lives. But I digress...when I found out her big brother, Michael, was getting married, I was so excited to help in any way I could. Traditionally, you know I am a Wedding Planner... this day, I was to be an Officiant and a pseudo-florist! I got ordained some time ago in order to be best prepared for anything thrown my way during my weddings (Priest didn't show up? No big deal!). I never really imagined someone would actually want me as their Officiant (not a backup Officiant, a REAL Officiant). I have also always been interested in wedding flowers, but felt that was best left to the professionals! Needless to say, I was happy to help out in both ways when I found out it was needed. I will admit, I was very nervous on the day of the wedding. Even though we only had 15 guests, I wasn't sure how I would handle this big responsibility. I have a tendency to laugh hysterically during inappropriate times, would I do this? Would I start bawling like a fool? In the end, I did neither and just read my ceremony and it was short, sweet, and perfect. The flowers... oh, the flowers. I thought it would be pretty easy to put together a couple of bouquets and boutennieres. No problem, right? Just throw them together and tie 'em up with some pretty ribbon. No. 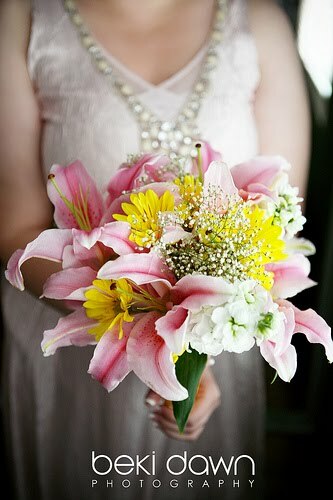 It took me about 3 hours to do the 2 bouquets and 2 bouts! I was nervous nobody would like them since it was my first try. I was wrong! 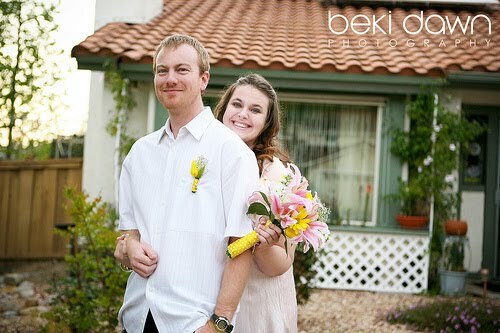 Everyone loved them and Hannah (the beautiful bride)was so happy. All in all, this day was super amazing, and I was so blessed to take part. Now onto the most important part of any wedding... the photographer! 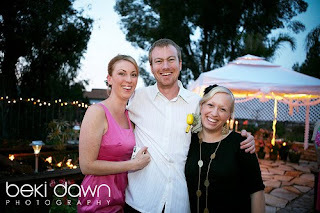 Beki is a fabulous wedding photographer, and also happens to be Jenny's old roommate- so, we have known her since we were about 17 or 18. I always admire her work. As a photographer, she was easy, fun, and un-invasive, and these pictures could NOT have come out any better. 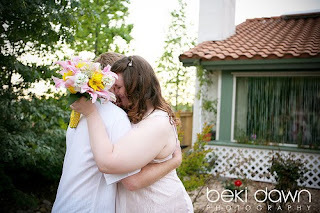 I really suggest you look into her work when choosing a wedding photographer. Beki was even nice enough to take a picture of Jasper and I with our child... Photobooth Tibbets! 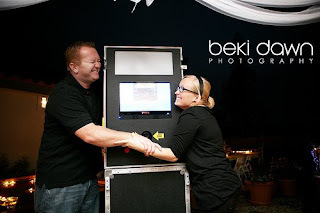 Yes, meet the After the Engagement Photobooth! Thanks so much Beki for capturing this day flawlessly! 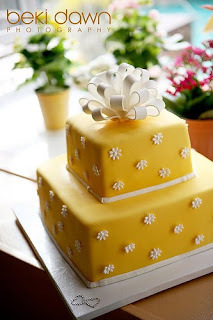 you want me to eat year old cake?